← Friday 2nd October 2015 – Good old Sarpo Mira!! What a fabulous time I had at the “Challock Chilli Fest” this weekend. It was exhausting, but brilliant fun. I was signing both my books, “Lottie and Dottie Sow Carrots” and “Lottie and Dottie Sow Sunflowers” over the weekend. Serena and Stephen at Victoriana Nursery Gardens are such lovely people and their 2 daughters are amazing as well. There were loads of different stalls selling so many wonderful items. The Saturday started very foggy, but it finally cleared and the sun came out. The Sunday was glorious all day and even Elvis turned up and did some singing. I sold and signed loads of books which was great fun. Had wonderful chats with all sorts of people, some very accomplished gardeners and others just starting out on their gardening adventure. I also met several people who already follow me on my channel or blog which was brilliant. A fantastic weekend was definitely had by me and hope by everyone who turned up. Looking forward to next year, that’s assuming they do it again, but I expect they will. 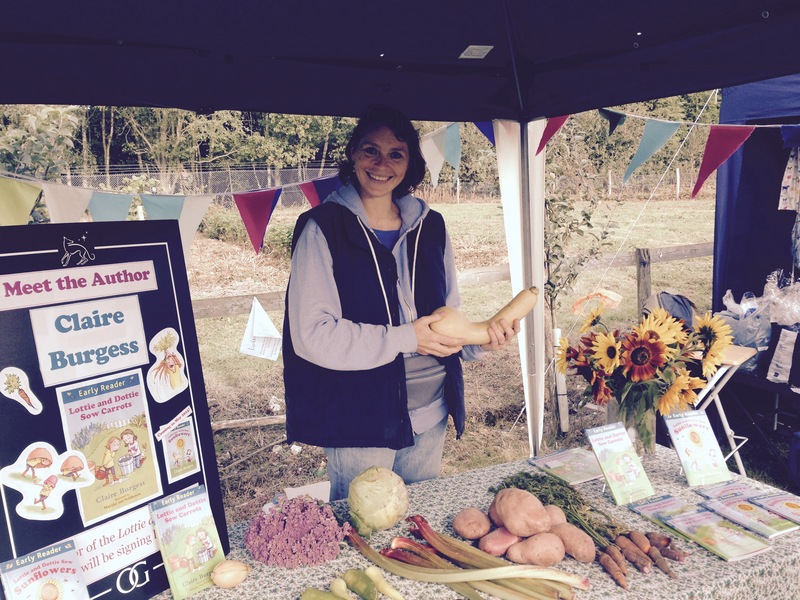 Here I am holding my favourite shaped vegetable of the year….so far!! This entry was posted in Uncategorized and tagged challock chilli festival, claire's allotment, Lottie and Dottie sow carrots, Lottie and Dottie sow Sunflowers, Victoriana Nursery Gardens. Bookmark the permalink.